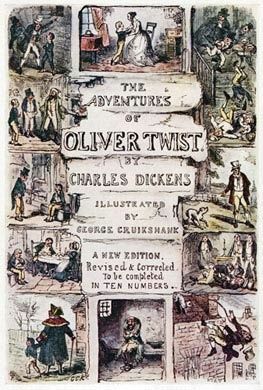 #AdventCalendar Day 3 #orphans and #CareExperience in fiction: #OliverTwist by Charles Dickens. The story centres on orphan Oliver Twist, born in a workhouse and sold into apprenticeship with an undertaker. After escaping, Twist travels to London, where he meets “The Artful Dodger”, a member of a gang of juvenile pickpockets led by the villainous Fagin. After this he is sold into apprenticeship with an undertaker. He runs away and travels to London where he meets the Artful Dodger, a member of a gang of pickpockets headed by the villainous Fagin who runs a ‘school’ for thieves. Oliver, naively believes the thieves make wallets and handkerchiefs and is wrongly accused of stealing a handkerchief and appears in court. Somebody comes forward to say it wasn’t Oliver. Ill, he faints in court and, Mr Brownlow who reluctantly brought the charge, takes Oliver home where is cared for and after proper nourishment begins to blossom. But, Fagin fearful Oliver will spill the beans, kidnaps him and brings him back to the den of thieves. Recruited to carry out a robbery by the sinister Bill Sikes and kind-hearted Nancy, Oliver is once more plunged into the dark criminal underworld. After a burglary attempt goes wrong, Oliver is shot leaving the house and in a strange Dickensian twist of fate, is taken in by the people he was supposed to rob. Nancy, who feels guilty at her part in Oliver’s downfall, attempts to right her wrongs and meet with Mr Brownlow to warn him that Fagin is plotting to kidnap the boy again. But, Bill Sikes becomes suspicious and follows Nancy, and thinking she has betrayed him, beats her to death. Whilst trying to escape a mob angry at her death, Sikes accidentally hangs himself. Fagin is arrested, tried and condemned to the gallows. Oliver meanwhile lives happily with Mr Brownlow, who it turns out was a friend of Oliver’s father, and subsequently adopts the boy. Oliver Twist (1837), Dickens famous social novel was notable for its unromantic portrayal of the criminal underworld, as well as for exposing the cruel treatment of the many orphans in London in the mid-19th century.